Reaching a fork in the road far ahead of photographer Goldman, who was following with our maps of north- eastern Italy in the car, I realised that I hadn’t a clue which way to go. 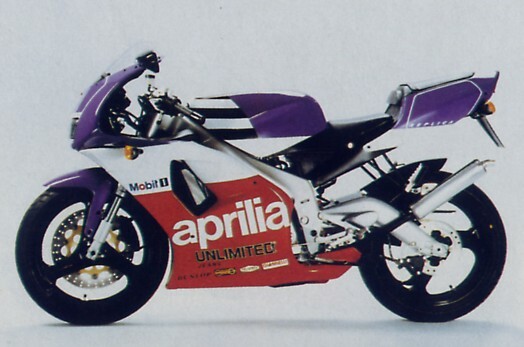 There was no alternative but to park the gorgeous red-white-and-purple Aprilia, sit in the sun and hope that eventually he’d catch up. Despite all my efforts, despite the fact that this tuned and fully-faired missile was one of the raciest and most high-tech streetbikes I’d ever sat on, I probably hadn’t managed to persuade it to push my un-aerodynamically large body above 100mph all day. 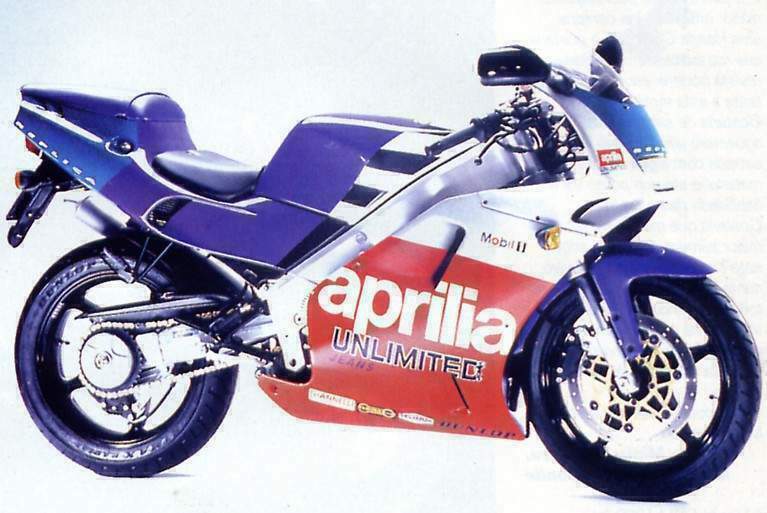 For all its upside-down forks and its single-sided swing arm and its butch alloy frame, the Aprilia Futura’s most significant feature is nevertheless its engine’s capacity of about half the average-sized shampoo bottle. twisting the neck off a 125 without putting life or licence at too much risk. That ride across country back to Aprilia’s base near Venice was memorable by any standards, despite the lack of out-and-out speed, and travelling half as fast again on the straights would not necessarily have improved the ride much at all. Lucky is the young Luigi whose rich padre presents him with one of these on his birthday. What I’d have made of being plonked on this motorcycle at the age of 17 I can’t begin to imagine, and I suspect that it’s probably just as well I didn’t have the chance to find out. British novices won’t find out immediately either, of course, because they’ll be restricted to a 12bhp version of the Futura that after riding the full-power version must feel as though it’s still parked on the centrestand (not that any AF1 is weighed-down by any such encumbrance, of course). All the more reason for passing your test, after which time, on being shown a photocopy of the owner’s full licence, the new Aprilia importers will forward free-of-charge the exhaust power-valve that restores the missing ponies. Aprilia Moto UK won’t be providing anything at all for the Futura for several months, it must be said, because they can’t get stocks of the new bike yet and will initially concentrate on selling the established AF1 Replica model. When the Futura does arrive it is likely to prove boss of the strada in the 125 class just as it has in Italy, where it’s apparently outselling all competition. The Futura is basically the latest version of the AF1 series. It effectively brings together the Replica and the AF1 Sport -- the very similar but slightly more powerful production-race version of the twin-headlamp screamer -- to produce one new machine that is even slicker, even tricker and even more obviously suited to the racetrack than its predecessors. The main difference between the Replica and Sport models is the carburettor, which is a Dellorto that grows from 28mm in size to 34mm for the competition bike. The Futura gets a slightly modified version of the bigger fuel-bucket, natch, which helps push claimed output up one whole donkey from the Replica’s 32.8 to 33.8bhp precisely, at 11,000rpm. 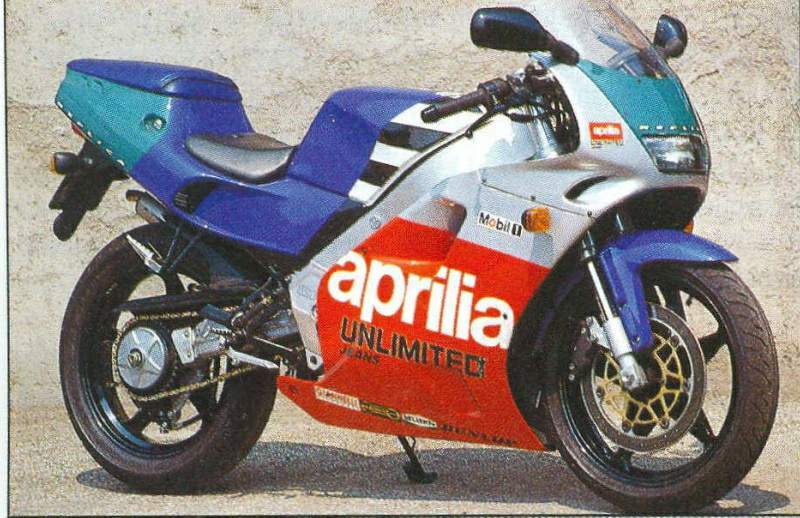 It’s a watercooled two-stroke single, built by Rotax to Aprilia’s spec. It has almost square bore and stroke dimensions of 54 x 54.5mm, a balancer-shaft to damp out vibration, and an electronically operated exhaust valve that is appropriately named RAVE, and really gets the party swinging after eight (thousand rpm, not pm). On the other side of the engine the Sport’s side-mounted airbox is replaced by a more central chamber that sits between the top tubes of the bolt-on rear subframe, and is shrouded by plastic and fed by two long plastic ducts running back from the nose of the fairing. The main frame is a modified version of Aprilia’s aluminium alloy twin-spar job, and is so neat and sturdy-looking a piece of kit that it wouldn’t disgrace something from down the coast at Bimota, let alone a puny mass-produced 125. The main extrusions now bulge out a little on their route from steering head to swing arm pivot, and an alloy plate has been added on each side of the subframe, presumably for reinforcement. But the most obvious difference is that the satiny main spars have been left on view instead of covered by bodywork as they were before. The suspension set-up at each end looks seriously serious, and the Futura’s forks and shock combine with the hugely rigid frame to give handling that matches the spec. One surprise is that the suspension is non-adjustable. It’s firm but I felt no desire to change things, and for novices the lack of fiddling potential is probably a good idea. Second surprise is that the steering is not ultra-quick, at least by small-bike standards. The Replica’s rake and trail have been kicked out half a degree and 3mm to give 26 degrees and 95mm, which is not radical by current standards. The similarities start early. From the pilot’s perch on the skimpy seat, far more thinly-padded even than the Replica’s, it’s a fair reach to the low clip-ons across a fuel tank whose flush-filler is labelled with the words ‘specially developed for racing’, in case you were in doubt. The wickedly curving screen comes up to meet your wild-eyed stare. Below it, the cockpit houses a typical array of partially foam-mounted dials, and is bordered by a pair of surprisingly useful mirrors. Feet are held predictably high but the Futura feels so long and generally roomy that it’s hard to believe this really is just a 125. (Unless you try riding pillion, which requires membership of the National Union of Contortionists.) Press the button, hear the tinny two-stroke rattle and, well, perhaps it is a 125 after all. Then you pull away - or rather this flash- leather-suited professional test rider attempted to pull away, failed to give the gutless motor enough revs, and stalled right outside the factory’s front door. Thank God for dark visors. slight-but-not-troublesome tingling through the handlebars and seat). If a corner should intervene before the Futura has had a chance to stretch its legs in sixth gear, then so much the better. A squeeze on the big single disc, which is progressive but not as brain-rotatingly potent as I’d expected from a bike weighing only 250lb, brings the speed down in moments. Then you shuffle across the seat, flick the Futura into the bend and attack the throttle again after making sure to Get That Knee Down if at all possible. You owe it to the people who designed this bike, after all. Naturally, it’s in the bends that the Aprilia exudes the classy feel of a serious track-ready motorcycle. There’s none of the nervous, underdamped feel that comes with many small sportsters. You need a little effort on the bars to move the front wheel off-line, after which point the Futura tracks with absolute precision and holds its line with wondrous stability even in ripply corners. Both wheels are five-spoke 17-inchers instead of the previous seven/nine spoke design, and they wear radial Dunlops whose generous widths and soft compound allow the Futura to be whistled through corners as fast as just about anything on two wheels. Then you’re back on the power, the single-pot motor is revving hard, your left boot is flicking frantically and your head is back behind the screen as you flog the guts out of those thirty something horses.. 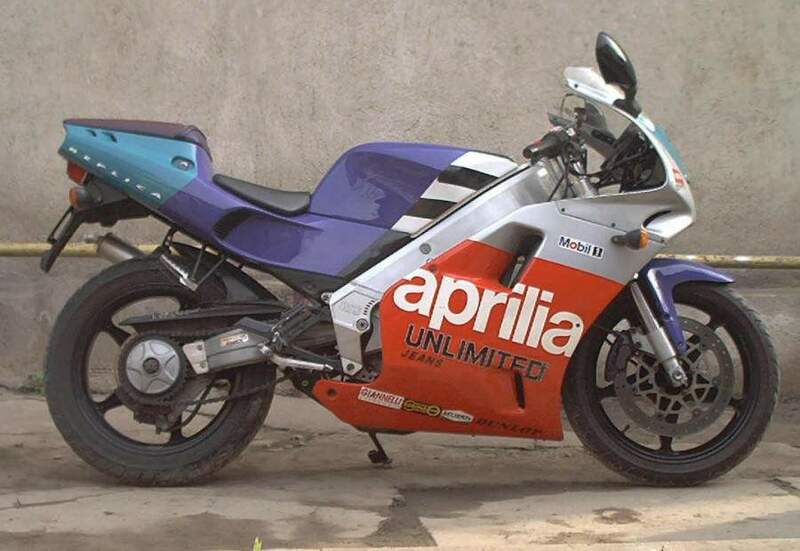 If you’re a 17-year-old learner with that sort of money to burn, then by now you probably don’t need directions to the nearest Aprilia showroom. Anyone else would have to be pretty sure that they really wanted to get their two-wheeled kicks from head-down, no-nonsense mindless boogie on a bike with the cornering power and charisma of a Ferrari but the out-and-out speed of a Fiat Panda.